Honey? Honey? Where are you? On a sunny spring afternoon in Beaverlodge, Alberta a diverse and eclectic group of bee keepers and scientists from across western Canada and the United States have come together in a classic, peaceful farm setting at the Agriculture Canada government research facility to talk about bees. It’s the annual Beekeepers Field Day, but the subjects of the presentations and talk around the picnic tables in this pastoral scene are less peaceful than the serene vision of a field of bee hives. 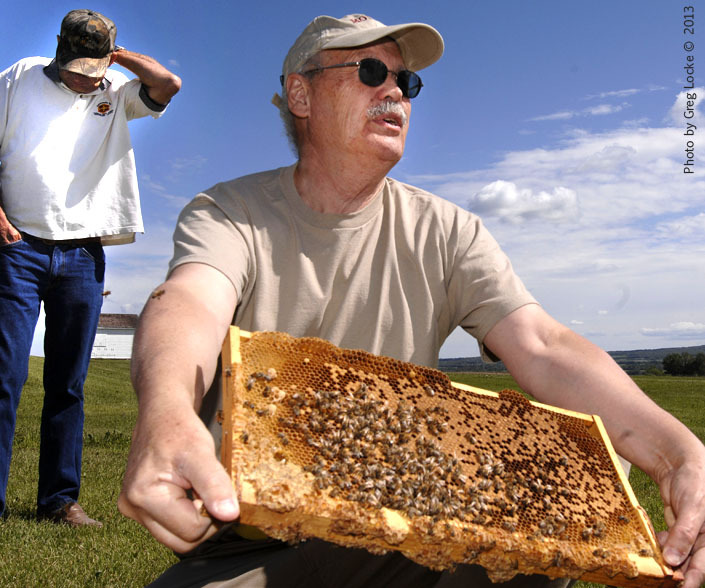 Among those dressed in lab coats, traditional Mennonite, and the ubiquitous Wrangler denims and Stetson hats, the talk is of the problems apiarists face trying to keep their hives and colonies healthy and productive. Honey bees have always faced threats and perils from the natural world, such as Nosema, viruses, fungii, Varroa mites, predatory wax moths, and hive beetles. Attacks or infestations from these threats, or simple winter die-off, have caused massive losses before. But now something strange is happening, especially inside the bee hives of North America. Biologists call it Colony Collapse Disorder because they do not know what it is, or why its happening – but the term certainly describes what occurs when bees simply disappear, leaving the queen and too-few workers to take care of the brood in the honey comb. The brood dies and the colony collapses. Unlike known threats to bees, such as the Varroa mite which has devastated bee colonies in Canada since 1989, CCD leaves no evidence. There are no dead bees in the hive, no bees with obvious infections: the bees just disappear without a trace, making it difficult to do epidemiological studies. Jerry Bromenshenk is an American research professor at the University of Montana and CEO of Bee Alert Technology, Inc. His company studies bees and their behaviour, and has used them to detect and monitor biological and chemical agents in the environment. He has also identified the different sounds in a bee hive when a disorder is present or a colony is under distress. His teams have been working to identify the cause of CCD. The brood is the bee pupae and larvae which grow in the honey comb of the hive. Other findings, said Bromenshenk, was that the cluster would not feed themselves even when there was plenty of food; predators such as hive beetles and wax moths would not enter a hive where CCD was present; and bees from other hives would not steal from the infected hive. Bromenshenk said the disorder, first observed in Florida and Pennsylvania, has now spread to 35 states in the United States, where the honey yield is at a historic low.. Some bee keepers have reported losses of up to 75 per cent of their colonies – although this may be due to a combination of factors, not entirely CCD. “Dome deaths may be from a secondary causes or infections, much like a burn victim dies from infections or damaged immune system, not the burn itself,” said Bromenshenk. All of this has Canadian beekeepers watching their hives carefully for changes to normal mortality rates. “We are looking at every possibility right now. A new virus, genetic mutation, environmental changes, industrial pollution, new biologicals or pathogens or the cumulative stress of all of these,” said Bromenshenk. Environmental scientists have called the honey bee the new “canary in a coal mine.” Bees are wholly or partially responsible for the pollination of thirty percent of all crops and ninety percent of wild plants, and the importance of the honeybee has increased as other natural pollinators have disappeared. Many crops are wholly pollinated by bees. Early in 2013 new research has caused many countries in Europe and South America to ban a group of pesticides called neo-nicotinoids. Studies suggest that neonicotinoids, produced by chemical and pharmaceutical giant Bayer, are extremely toxic to bees, even in very small amounts. The pesticides are water-soluble, persist in the environment for years, and are most-commonly used in corn and grain production but also for home gardening. American chemical company Monsanto is also under scrutiny for its use of the pesticide in genetically-modified corn products. Scientists such as Bromenshenk feel the decimation of the bee population is a result of some or all of these factors coming together to create an environment that bee cannot survive.